THE WRITING BUDDHA - Opinions | Books | Movies: Amazing Secrets of the Bhagavad Gita (Book Review- 4.5*/5) !!! Amazing Secrets of the Bhagavad Gita (Book Review- 4.5*/5) !!! There are so many books that are releasing these days based on Hinduism, Bhagavad Gita, Mahabharata or Ramayana in the author’s own version. I am specifically attracted towards this genre because of my interest of knowing about my religion in the simplest language. I have tried reading the Bhagavad Gita written by some renowned sages but failed to understand the meaning and its implementation in my life which made me buy these books which were written for people of 21st century to understand what the holy book is actually trying to say and how can we implement it in our day to day life. 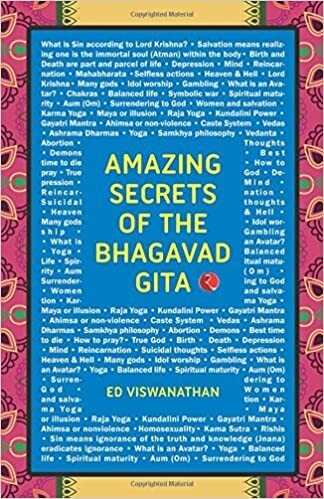 The recent book that I read in the same genre in the quest of understanding my religion better is “Amazing Secrets Of The Bhagavad Gita” written by ED Viswanathan. The cover page itself consists of many questions that we have in our mind about our religion and what exactly is the right path to walk upon. And then the book is written answering all these questions. It is narrated as a conversation between Grandfather-grandson where grandson is asking questions about Gita and grandfather answers them all in the easiest possible manner so that the meaning can be understood by the child. The book starts with making us understand the several scriptures present in our religion and how Gita is one among them. The author also tells why Gita is the most referred book and when does it actually occurs during the war of Mahabharata. Who have written the book and how is also told to us. Only after clearing the basics did author move towards the prominent questions directly based on Gita. The book is written in a very easy language and author has been successful in making us learn many things about our religion. Many things are covered in this book which makes the reader more than happy as some books are very small talking about only one aspect of Gita. After every topic is covered, author has summarized the main quotes in the end for us to remember them and refer them if in case we do not have much time to read this book again. The author have not written this book in the most popular format of giving the Sanskrit sentence first and then translating it word to word. He has just kept narrating it as a speech which makes it easier to read and understand. I give this book 4.5 star out of 5.